Looks like Winn has changed the playing ground when it comes to grips. Want to add quick distance to your golf game? Changing to these grips may actually give you longer, higher ball flight. These WinnLite grips will actually change your ball flight because they are extremely light (which moves the balance point of your club down, resulting in a higher launch angle). These grips are the highest tech grips on the market. The PolyCord material is really cool. This innovative material has a remarkable feel. The coolest thing about the grip is the weighting design. The feather-light 27 grams of material changes the weight of your golf club towards the clubhead. The idea is to give you more swing speed and launch your ball high and long. Although the grip is light, it still absorbs shock well and doesn't twist in your hands. It holds up well in the weather and in sweaty hands. 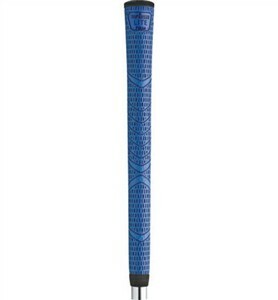 I recommend these WinnLite grips to golfers looking for a higher launch angle and more distance (and who isn't?) There are three firmness levels for your taste: soft, medium, and firm.